The Bellemont Mill Village Historic District was listed on the National Register of Historic Places in 1987. The Bellemont Mill Village Historic District is comprised of the three-story brick mill building and the twenty-three associated one and two-story frame mill houses, one of the most intact examples of a late nineteenth century textile mill village in Alamance County. With its textile-manufacturing industrial base, Alamance County was in the forefront of industrialization of the North Carolina Piedmont in the late nineteenth and early twentieth centuries. Bellemont Mill Village was built in 1879-1880 by brothers L. Banks Holt and Lawrence S. Holt, major figures in North Carolina’s post-Reconstruction textile-based industrial revolution. 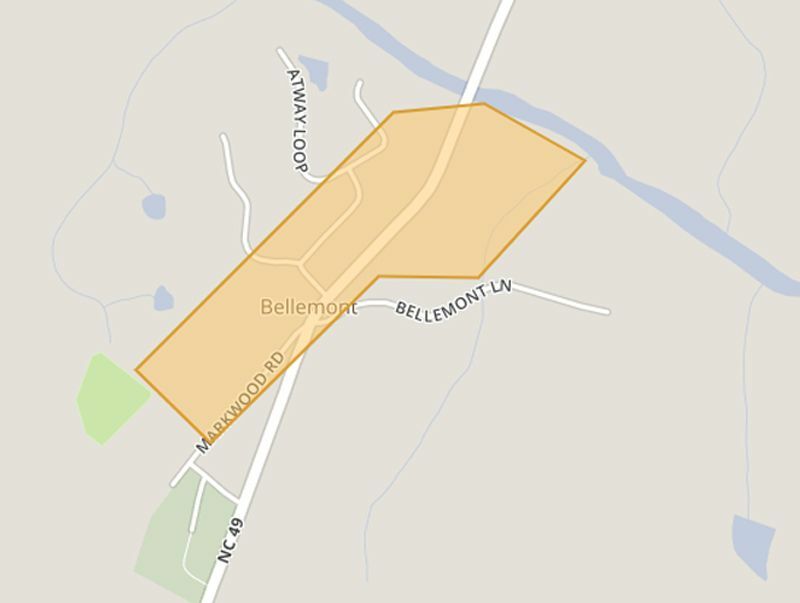 Bellemont is believed to be the earliest extant mill village in Alamance County from this post-Civil War period. Bellemont Mill Village is architecturally significant because of the early modern construction techniques, including the use of circular sawn framing timbers, utilized in the mill and in the distinctive I-house dwellings built for the mill operatives. The mill is architecturally significant because of its “slow-burn” construction method, decorative corbelled pendant cornice and segmental arched windows. Both the mill and the houses retain their architectural integrity, and the village retains its rural setting. The period of significance for the Bellemont Mill Village Historic District extends from its construction date, 1879-1880, until 1937 when the village was first subdivided and some of the houses were sold to private individuals. Edwin Holt’s Alamance Factory prospered and in 1853 he and his son Thomas learned the dyeing process and introduced “one of the South’s first brand name fabrics,” Alamance Plaids, the first colored cotton cloth woven on power looms in the South. The mill’s success was assured and by 1850 Holt was the richest man in Alamance County. The mill, which employed 53 women and 8 men, ran throughout the Civil War producing substantial amounts of yarn and cloth for the Confederate troops. Banks served with distinction during the Civil War and after the war returned to Alamance County to farm and work in his father’s Alamance Factory. He also held a large interest in the Holt-owned Carolina Mill. In addition to the Bellemont Mill, Banks was a partner in the E.M. Holt Plaid Mills, sole proprietor of the Oneida Mill, and a partner in the Altamahaw Mill. With his father and brothers (in particular, Lawrence, who proposed the idea) he founded the Commercial National Bank (now North Carolina National Bank) in Charlotte in 1874. In addition to his manufacturing and banking ventures, Banks operated the 1,400-acre Oak Grove Stock Farm where he raised prize-winning cattle, sheep and pigs. Lawrence Holt attended Davidson College for a short time after graduating from military school, but withdrew to work in his father’s Charlotte wholesale grocery store. Lawrence returned to Alamance County about 1875 to clerk in his father’s textile mill. In the late 1870s he established a tanyard in Company Shops (now Burlington) which produced leather belting for driving pulleys in cotton mills. In 1879 Lawrence assumed management of E.M. Holt’s Sons Mill and Carolina Cotton Mill. In 1883 Lawrence invested his profits from Bellemont Mill in the creation of another factory, the E.M. Holt Plaid Mill. The next year he and Banks bought the Altamahaw Cotton Mills on Haw River near Elon College. In 1885 Lawrence purchased Lafayette Mills in East Company Shops and changed the name to Aurora Mills. (Lawrence Holt’s sons Erwin and Eugene continued the operation of Aurora Mills until the early 1930s.) Lawrence’s principal philanthropy was the Episcopal Church and he is largely responsible for construction of St. Athanasius Church in 1879 (National Register listed) and the Church of the Holy Comforter in 1909, both in Burlington. The massive sills and floor joists of the mill were cut on a circular saw, a relatively new and superior type of saw. “Ten years earlier, these framing members would have been hand hewn. By 1880 there were five saw mills in the county each operating with one or two circular saws.” The large oak sills of the mill houses were also cut with a circular saw. A forty year long period of steady textile manufacturing industry growth in Alamance County followed construction of the Bellemont Mill. Between 1879 and 1883 eight new mills joined the seven Holt family mills already in operation; between 1886 and 1894 nine new mills were constructed, and between 1901 and 1904 four others were built. The last Holt family cotton weaving mill was built in 1919 by Edwin C. Holt and Paul Stevens and incorporated as Stevens Manufacturing Company. Until the late 1890s Alamance County ranked either first or second among North Carolina counties in number of spindles; in total number of looms, it held first place until 1916; and it was first in the ratio of looms to spindles until the late 1920s. After Banks Holt purchased his brother Lawrence’s partnership share of the Bellemont Mill in 1897, he operated all his mills as proprietorships until 1909 when he established the “L. Banks Holt Manufacturing Co.” and transferred ownership of the properties to the Holt family-run corporation. With five mills under its ownership and control, the L. Banks Holt Manufacturing Company was the largest producer of cotton fabrics in Alamance County. Banks Holt died in 1920 and the corporation was operated for several years by his heirs. L. Banks Holt Manufacturing Company began to dispose of its mills during the mid-1920s when the production of cotton goods became less profitable and cotton was replaced by rayon and other synthetic fabrics. 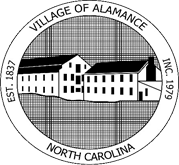 In 1927 the entire village of Alamance, including the Alamance Factory, was sold to Standard Hosiery Mills. Bellemont Mill remained a part of the L. Banks Holt Manufacturing Company until 1933 when E.M. Holt Plaid Mill, Inc. purchased the mill and village and converted the mill to rayon manufacture. During the 1930s many textile mill owners, faced with the high cost of maintaining a mill village, sold the houses to their former tenants. E.M. Holt Plaid Mill, Inc, subdivided Bellemont village in 1937 and sold sixteen of the houses to five individuals. Burlington Milling Company, now Burlington Industries, purchased the Bellemont Mill and the remaining houses in 1939. As part of Burlington Industries’ operations, the mill was renamed Bellemont Weaving. Burlington Industries operated the mill until the late 1950s, but sold all of the remaining mill houses between 1942 and 1944. In 1958 Hazel Knitting Mill, Inc., owned by Charles Foster and William S. Foster purchased Bellemont Mill. After William Foster’s death in 1973, the mill was leased to his son, William S. Foster, Jr., owner of Flexon Fabric Inc. Flexon produced polyester double-knit fabric, and employed approximately fifty workers at the former Bellemont Mill. Foster purchased the mill in 1977 from First Union National Bank of North Carolina, the executors of his father’s estate. Foster opened Flexon Fabrics there until 1981 when he moved the business to his Haw River plant. Tasker Industries ofGreensboropurchased the Bellemont Mill in 1981 and are the current owners of the mill; the mill building has remained vacant since that time. Currently several of the mill houses are owned by retired mill employees; other are owned by employees of other Burlington area industries or by real estate investors. When architectural historian Dr. Carl Lounsbury surveyed the county’s historic architecture in 1979-1980, eight former Holt family controlled mills survived in various states of intactness. Since Lounsbury’s survey was completed, the Bellemont Mill has ceased operation. The mill village continues to be a viable community. A North Carolina developer has expressed a strong interest in adaptively reusing the Bellemont Mill building for residential development. The Alamance County government is supportive of this type of project for the mill building. Other local real estate developers have renovated some of the mill houses, as have various Bellemont home owners. To date no archaeological investigations have been conducted within the Bellemont Mill Village Historic District, but given the undisturbed condition of the land and the number of relatively intact structures present, it is likely that significant archaeological remains may be present. Alamance County has an active Historic Properties Commission and in 1985 this group was accorded certified local government status. As part of its preservation planning efforts, Alamance County requested the nomination of the Bellemont Mill Village Historic District to the National Register of Historic Places.